ADVANCED STAGE IN TURKEY’S SYRIANISATION: HOLD ERDOĞAN AND AKP RESPONSIBLE FOR THE CATASTROPHE IN ANKARA! Suicide bombers have this time hit the heart of working class Ankara, the capital and second largest city of Turkey. This is the third in a row for the city: on 10 October, two successive explosions killed more than a hundred people during a demonstration organised by trade unions, demanding peace and expressing solidarity with the oppressed and heavily repressed Kurdish people of the southeast of Turkey. 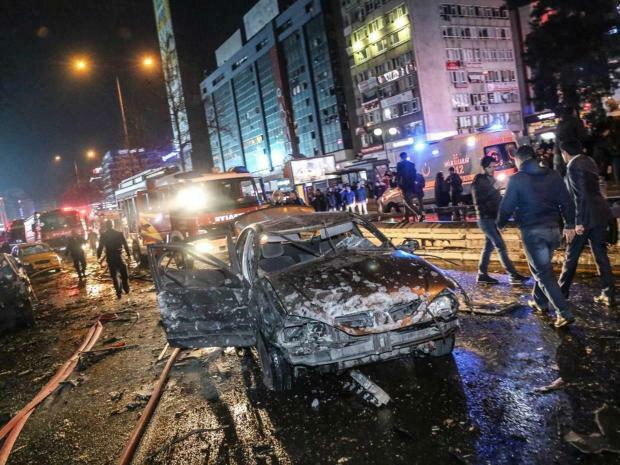 Then, on 17 February, it was the heart of official Ankara that was hit by a suicide bomber in an operation that killed 29 officers and civilian employees working for various armed forces as they were headed home after work. Now, it is the working people of Ankara that have been killed in a bombing attack in Kızılay, both a popular shopping and recreation area and a transportation hub where the metro, municipal buses and the shared taxi system, all serving the labouring masses, cross. The Revolutionary Workers’ Party extends its condolences to the families of all those who lost their lives in yesterday’s bombing and hopes that the wounded will recover soon, without any physical and psychological traces. Three bombings in the space of five months in the capital city of Turkey, accompanied by bomb explosions in Suruç on 20 July 2015 (34 casualties), Diyarbakır, the largest city of Turkish Kurdistan, on 5 June 2015 (4 casualties), and Istanbul on 12 January 2016 (11 casualties, all foreign tourists). Many of these bombings are almost universally attributed to ISIL (otherwise known as the Islamic State), with which the Turkish government of AKP has had an ambiguous relationship that extends from close collaboration to hostilities, the latter probably devised to create a smokescreen to hide the real state of affairs. One, the 17 February 2016 explosion, has been claimed by an organisation called TAK or the Freedom Hawks of Kurdistan, an organisation that is considered to belong to the PKK tradition although it purports to be independent of the PKK, in retaliation to the horrendous repression by the Turkish state of Kurdish cities and districts such as Sur and Cizre. Irrespective of which organisation claims the responsibility for this new suicide bombing operation in Kızılay, Ankara, it is Recep Tayyip Erdoğan, the president of the republic, his acolytes within the government and the media, and the Davutoğlu government of the AKP, the latter slavishly following in the footsteps of Erdoğan. This is because the explosion yesterday cannot be taken up in isolation from the whole political strategy pursued by the Erdoğan clique since the defeat of the AKP in the 7 June 2015 elections. Having lost its comfortable majority in parliament for the first time in 13 years as a result of the resounding performance of 13 percent of the vote obtained by the HDP, the Kurdish parliamentary party, the ruling clique within the AKP resorted to an about-turn on the Kurdish question. It started a wholesale attack on the Kurdish movement that brutally took civilian lives as well, whereas for two and a half years it had been pursuing negotiations with Öcalan, the historic leader of the movement in prison, and the PKK, using the intermediation of the HDP. Pushed up against the wall by the election results and haunted by the spectre of the corruption files against himself and his family that had been, with great difficulty, suppressed through extra-constitutional and unlawful methods, Erdoğan decided to throw Turkey into fire rather than bowing before the verdict of the ballot box. The war on the Kurds was, in time, accompanied by the stepping up of Turkish belligerence with respect to Syria, the AKP government threatening more than once the use of ground troops inside that country. That process of Syrianisation has now reached an advanced stage. Although Turkey is not officially at war with any country and the war waged by the special forces of both the police and the army inside towns and districts in the Kurdish area are officially dubbed “anti-terrorist action”, the reality on the ground is no different from a country ravaged by war, albeit at an uneven pace in different parts of the country. The Kurdish cities encircled by the special forces in question now lie in ruins. They are no less devastated than Syrian cities. The civilian population has suffered its share of the burden in the same manner as the population of Syria. The dead bodies of scores of Kurdish combatants were found burnt, some after they had fallen. Whole cities are now virtually ghost towns, their population having decided to flee the ravage visited on their cities, neighbourhoods and homes by the indiscriminate shelling of the army. The death toll is still not certain, but is very high without a shred of doubt. In the statement published after the 10 October massacre the DIP said: “The October 10 massacre transformed Ankara into Suruç…” Suruç is the town in southeast Turkey where 34 young Turkish militants affiliated to a socialist group were killed, guilty for having shown solidarity with the Kurdish people of Kobanê under attack from the ISIL. The explosion yesterday in the heart of working class Ankara has transformed Ankara into Sur (or Sûr in Kurdish), a district of Diyarbakir, unofficially dubbed the capital city of Turkish Kurdistan by the Kurds, a district that remained under siege of the army and the police for over 100 days and where some of the worst atrocities were discovered to have been committed. Sur, Suruç, Suriye… That final word is “Syria” in Turkish. The process of the Syrianisation of Turkey is at an advanced stage now. The DIP says: It is not enough to ask for peace; only by bringing down the AKP can we put an end to this war.